Six stories, all inspired by Tokyo, a magical place that Wendy Nelson Tokunaga has observed both first-hand and from afar. Poignant, but also often laced with humor, these mesmerizing tales are sure to both entertain and move readers. What happens when you fall down the rabbit hole and land in Tokyo? A delightful novel about love, identity, and what it means to be adrift in a strange land. This story of a search has an Alice in Wonderland vibe; when Celeste climbs down the rabbit hole, one can't help but follow along. 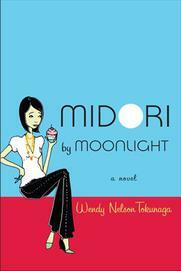 Can Japanese expat Midori Saito find her American Dream and the perfect dessert? Have you finished your novel or memoir, but want to know if it’s ready to send to an agent? Or have you been sending your manuscript to agents, only to get rejections? My road to publication was a rocky one, resulting in hundreds of rejections on my first four novels. I received a two-book deal on my fifth novel in 2006, just as I was starting my MFA program. I have learned many things the hard way and I enjoy helping other writers avoid some of these pitfalls. The number of writers seeking agent representation increases every year and competition is fierce. It is more important than ever that your manuscript be as perfect as possible before sending it to an agent or publishing it yourself. I always work directly with clients and never "farm out" work to other editors. I offer valuable feedback on your manuscript’s strengths and weaknesses in regards to characterization, plot, structure, prose style, etc. I provide this in a comprehensive written report that includes a summary of what works, what needs to be improved, and suggestions on how to strengthen the manuscript. My comments are sensitive, but also practical and to-the-point, enabling you to make progress. Follow-up via email, phone call or in-person visit (for those who live in the San Francisco Bay Area) are included in my fee as well as feedback on up to 20 double-spaced pages of revision. To see if we'd be a good fit, I always read the first five pages of a new client's manuscript for free to give detailed feedback, which will give you an idea of my style and how I work. After that, I charge $6 per double-spaced page. Contact me at info@WendyTokunaga.com to discuss your project and ask me any questions about my services. Writing an effective query letter to an agent can be almost as difficult as writing your novel! For a flat rate of $100 I will help you craft an effective agent query. Write to info@WendyTokunaga.com for more info. I am an instructor for Stanford's Novel Writing Certificate Program. This is a terrific program that allows you to fulfill your dream of writing and completing a novel. Find more info HERE. I am also a regular panelist and popular editing session instructor at the annual San Francisco Writers Conference. A very comprehensive and illuminating conference, it's held every February in San Francisco. Find more info HERE. I hope to see you there! I also appear at writers' conferences and seminars throughout the San Francisco Bay Area. Please sign up for my newsletter or follow me on Twitter at @Wendy_Tokunaga or Facebook for news and occasional writing tips. I came to Wendy with a scattered manuscript and little understanding of how a memoir should be crafted. Two and a half years later, I signed with a New York agent. I didn't get to this place simply because I hired an independent editor. After all, I'd used a few others in the past. I got here because I worked with Wendy. She provided excellent line edits, developmental editing, and a reading list of memoirs. She's very easy to work with and her turnaround time couldn't be quicker. If you want to hear that you have a perfect manuscript and it'll go straight to auction, send it to a friend or family member. But if you're serious about publishing, you can't go wrong by trying your best and working with Wendy. Wendy coached me through the second draft of my first novel. She encouraged me to stay true to my own style and voice but also pushed me to address tough questions regarding the message behind the story and the best direction for the plot. Wendy analyzes both broad issues and small details. Her high standards and honest feedback have led to tremendous improvements in my revisions. Wendy is generous with her time and expertise, and I cannot thank her enough. I attended a class on characterization by Wendy Tokunaga at the San Francisco Writers Conference, and immediately took to her fun, yet intellectual style. She not only knew her stuff, but she had an air about her that seemed friendly, approachable. At the time I was receiving a lot of rejections for my manuscript. I knew the story had promise, but it needed something to push it across the line to compete at a level with other published works. I asked Wendy to conduct a full comprehensive content edit, complete with a chapter by chapter assessment. With her help I massaged the story, and submitted it to the League of Utah Writers writing contest/ five months later, Koicto won the grand prize for Best Manuscript in Show and has now been published by Sunstone Press. I give a standing ovation to Wendy and her professional editing style! Find more about Amy here. Wendy helped me get going on my novel, Headmaster, which I had originally developed as a play. She read my chapters with great sensitivity to language, characters and plot. Wendy is an astute critic but her suggestions are always constructive and practical. She helped me resolve important point of view issues, and provided valuable editing advice. In fact, she is an excellent line by line editor -- and my style improved after working with her. Wendy is honest, but supportive. While she refuses to sacrifice the truth to build up your ego, she also knows how to inspire you to reach your fullest potential. "If only I'd found Wendy . . ." That's how I begin whenever I tell someone about Wendy Tokunaga's spot-on editing and the difference she's made in my fiction-writing life. Her feedback is direct yet encouraging, and it's helped me with every aspect of my formerly recalcitrant novel. Wendy Tokunaga is an insightful, supportive manuscript consultant. Her no-nonsense feedback highlighted the strengths and weaknesses of my novel, with constructive suggestions for how to remedy the problems. Even when pointing out what’s not working, Wendy is absolutely encouraging. Her suggestions helped me get unstuck and tackle my next draft. As I have been telling friends who inquire about my writing, your fee is the best money I have spent in a long time. I know your insight will make a big difference in making my novel publishable.